Motorbike Season is Here - Hog Poker Run! It’s almost considered the “official” start to bike season even though most of us - given the great weather we’ve been having - have been on our bikes for weeks already. I’m talking about the Kamloops HOG Poker run that happens this May on the 27th and 28th. If you haven’t been on the ride before, then be prepared to be blown away as it’s one of the best in the West if not all of Canada. About 700 bikes start showing up Friday, May 27th and while the Poker ride doesn’t happen until Saturday, the good times begin happening when you arrive. After checking into your motel, head up to Kamloops Harley to pick up your registration package and stick around for some music, a BBQ and a parking lot party on Friday night. And of course, Kamloops Harley will be open all evening and you can bet they’ll have some great deals happening. By the way, with that many bikers in town, it’s best to book your room as soon as possible. There are lots of motels to choose from with a range of prices to fit any budget. Two places that have specialized in catering to bike enthusiasts are: The Accent Inn and The Country View Motor Inn. Both are biker friendly motels (right down to washing stations in the parking lot) with easy access to Hwy 1.Both have restaurant and fast food places within easy walking distance. For more information you can check out Tourism Kamloops’ website at www.tourismkamloops.com for more details on accommodation and restaurants. 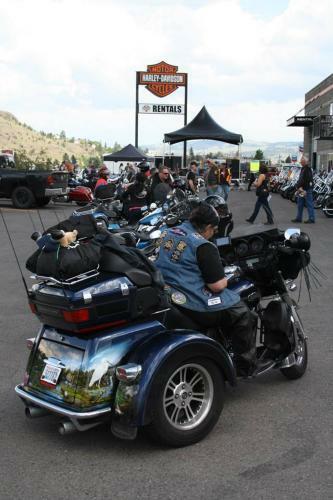 When Saturday morning rolls around, head back to Kamloops Harley for the start of the ride. There’s a pancake breakfast happening and if you’re planning on getting together with some others riders, it’s the perfect place to arrange to meet. There will be bikes everywhere but it’s still easy to find a place to park your ride and a great opportunity to see what everyone else is riding...Just another reason I like a motel that makes cleaning and polishing my bike easy. Once you’ve packed away a few pancakes and a coffee or two, it’s time to ride and if you’ve never ridden in the Kamloops area before, you are in for something unique. In fact, I know when some of my buddies come up here for the first time, they can’t believe this kind of ride friendly country exists just a few hours from Vancouver. There are so many amazingly different one-day rides around here that you’d need to stay for weeks just to try them all. For instance: This year’s Poker Run will at one point take you through the closest thing to a desert Canada has. For some of it, you’ll be forgiven if you think you’re riding through parts of Montana or Wyoming or even northern New Mexico. Sagebrush, grasslands, Ponderosa pines, sandstone hoodoos and long sweeper curves running through rolling hills. If it’s twistiness you’re looking for, the ride between Cache Creek and Fountain Flats will give you an opportunity to lean into a few and scrape some floorboards if you want to push it. This part of Hwy 99 seems purposefully designed for bikes, so enjoy and remember, you’ll be coming back this way, so you’ll get to experience it twice in one afternoon...which may still not be enough. 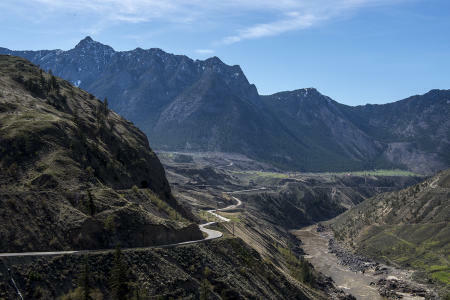 The ride back to Kamloops starts at Fountain Flats and after retracing your route to Cache Creek, you’ll head over and down to Ashcroft, cross the Thompson River and then begin a spectacular climb up into the high country as you head for Logan Lake. And speaking of Logan Lake...When you arrive you’ll pass two turn offs at the entrance to town. The one on your right, Hwy 97C, would take you to either Merritt or Spences Bridge. To the left is another ride to Tunkwa Lake and eventually back to Savona and Kamloops. If you’re thinking of staying an extra day or coming back soon, these are both rides I’d recommend and will be covering them in more detail in another blog. After Logan Lake, it’s a short run to Hwy 5 (the Coquihalla) and back to Kamloops. If four lanes are not something you’re into, don’t take the on ramp, continue straight ahead and try using the Lac Le Jeune road instead. It will still get you to Kamloops but through forest and ranch lands and on two lanes instead of four. The Poker Run ends with a dinner/dance at the Valley View Arena on Saturday night and the local HOG chapter has arranged for a shuttle bus between most major motels/hotel and the arena. Got questions about this or other rides in the area? Let me know. And remember, if you live in the lower mainland you can leave after work on a Friday and be here in just a few hours. Ride totally different roads on both Saturday and Sunday. Hang out at our two amazing Craft Brew Pubs and be back home by Sunday evening…It doesn’t get any better than that. Stop by the Kamloops Visitor Centre to pickup your copy of Motorcycle and Dualsport Circle Tours.